Multiple inheritance add too much complexity with little benefit. There are huge chances of conflicting base class member. For example, if there is a method calculate() in two base class and both are doing different calculation. What happened if user call calculate() in child class? Which method will work? Inheritance with Interface provides same job of multiple inheritance. Multiple Inheritance inject a lots of burden into implementation and it cause slow program execution. As you learned that c# doesn't provide multiple inheritance with classes, even you can implement it using Interface. Just see the programming example. In this chapter you learned multiple inheritance with Interface. Because the method defined inside interface has no body implementation so it must be define in child class. Interface helps to remove member confliction in child class. 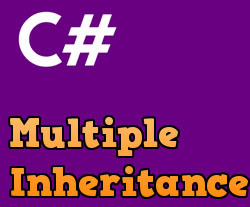 In the next chapter you will learn about  Sealed Inheritance in C#.